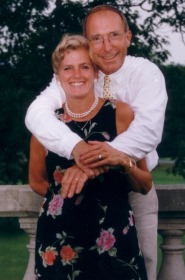 Bill and Patti started their candle-making business after a relative showed them some soy candles she had made herself, candles that didn't generate a lot of soot and had the most delightful scents. All the candles scents below will fill the room with a pleasing aroma. Best of all, you'll be able to breathe easier knowing the air is cleaner. Sure, you can buy candles almost anywhere these days, but beware of what's easy and cheap. 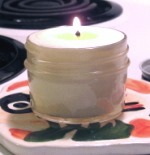 Candles made using ALL NATURAL soybean plant oils are simply better. Soy Candle, 8 oz. Mason jar - $12.00 ea. plus sales tax. *Choose from all 16 delicious candle scents (see below). 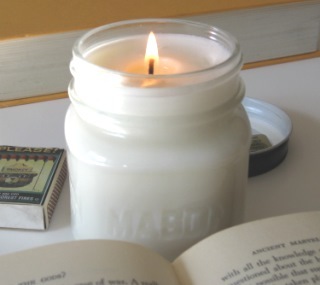 Soy candles produce significantly less soot and burn longer than paraffin wax. Your air purifier will require less cleaning and you'll breathe easier with soy. Gift boxes are important, as is the ribbon, filler gift shred, and subsequent shipping box. Candle gifts are all about presentation and quality, both in terms of the candle itself, and the packaging. We offer you several choices for ribbon colors that complement our candle scents, as with our Pumpkin Pie soy candy and orange ribbon shown here. Introduce yourself to clean burning, LOW SOOT scented soy candles by sampling our richly scented votives. Each votive is individually wrapped in plastic to lock in the candle scent, and the wicks are guaranteed to produce a strong flame, because we know there's nothing more discouraging then a candle that won't burn. Rest assured, that won't happen with our candles! Why Soy Candles are better? 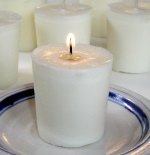 Candles made with natural oils from soybean plants burn cleaner and produce a lot less black soot then most candles. Therefore, the air quality in your home will be much cleaner. If you've ever examined an air purifier after burning traditional candles for any period of time, you'd see this black soot. Why worry about that soot, burn soy candles! "Both Bill and I love candle making. Next to maple sugaring, it's a wonderful activity to share with our guests. Each of our soy scented candles is handmade using all natural soybean oils right here at our bed & breakfast. We believe after you've tried one of our candles, you'll be so impressed you'll want to try more. Our candles smell wonderful! We use large wicks so they produce a nice flame, and because they're made of soy, they'll burn for a very long time with less soot. Our 8 oz. candles will last 50 hours! 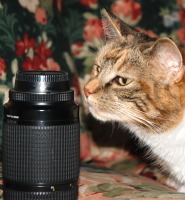 Enjoy your candles, and please consider our B&B for your Vermont travels." Baked Apple - Macintosh, maple syrup, and vanilla fragrances are blended, and the result is our very own Baked Apple candle scent that smells like fresh baked apples. A perfect candle for country kitchens. Bouquet of Roses - Say, "I LOVE YOU" with this candle. Bouquet of Roses offers that warm feeling that is more commonly experienced with fresh cut roses. An ideal candle gift for anniversaries, Valentine's Day, or simply to demonstrate your passion for that special someone. Delicious Vanilla - You have to smell this delicious vanilla candle to believe how yummy it is! Your first reaction will be to take a BIG bite, but then you'll remember... it's only a candle! Eggnog - Enjoy the delicious smell of eggnog without having to indulge in a high calorie glass of the tasty stuff. Let a soy candle fill your kitchen with the scent of eggnog! Floral Essence - This is a wonderful candle for the bathroom because it evokes a stong, pleasing scent that quickly fills the air. You'll find one in each bathroom at Shearer Hill Farm Bed & Breakfast. Hazelnut Coffee - By far our best kitchen candle, but you'll want to bring it to the dining room when you have guests for coffee. The delicious hazelnut coffee scent will make you want to pour a cup as fast as you can! Heavenly Chocolate - Who doesn't love chocolate? Now you can indulge in chocolate without the calories! It's a delicious way to enjoy your home. Holidays at Home - A BEST-SELLER according to our supplier of natural soybean plant oils used in making our soy candles. This soy candle scent is a unique combination of mulberry, mandarin orange, and cinnamon. YUM! 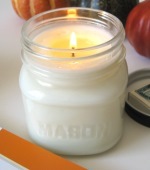 Macintosh Apple - A perfect candle for fall. Light this candle and within minutes you'll think you just brought in a freshly picked bushel of apples from the orchard. Some candles go well with coffee, this one goes well with apple cider! Pumpkin Pie - When autumn comes to Vermont, pumpkins are everywhere! You see them on front porches, on stonewalls, on front lawns... And don't be surprised if you smell a pumpkin pie baking in our farmhouse kitchen here at the B&B. 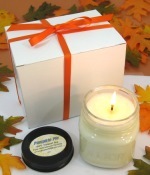 Of course it might be our delicious pumpkin pie soy candle! Ripe Raspberry - Fresh raspberries aren't always available at the market and when they are, they're usually expensive. A delicious Ripe Raspberry candle is simply a better way to enjoy raspberries, year round! Sweet Coconut - Bring the tropics home with our new Sweet Coconut soy candle. This delicious tropical scent will remind you of your favorite tropical escape. Vermont Lilac - This is a wonderful mood-setting candle when you need to relax after a long day. Curl up with good book or pop in a movie and enjoy the pleasing lilac fragrance. A perfect candle for yoga too. Wild Rose - Say, "I LOVE YOU" with this candle. Wild Rose offers that warm feeling that is more commonly experienced with fresh cut roses. An ideal candle gift for anniversaries, Valentine's Day, or simply to demonstrate your passion for that special someone. Zesty Citrus - This candle is all about having fun. Use it during dinner parties or whenever guests are in the house. The fruity citrus fragrances will make your guests feel like they're somewhere tropical, and who doesn't want to feel like that? Unscented - For those who like to burn a candle, but don't want the scent. 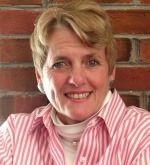 According to the March/April 2010 issue of Livin' Magazine, "It takes a special type of person to be an innkeeper." It's a path less taken, and..."It takes a special type of person to be an innkeeper."